I have a secret to share. A deep, dark one that I’ve kept hidden for a long, long time. It’s a secret that many people will judge me for. They may lose respect for me, or think I’m lazy. This is my secret: I don’t like content maintenance. At first I pitied content strategists in-house. Their work – content maintenance – seemed so frustrating! But then I began to suspect something… what if it was my fault that their work was frustrating and difficult? It was still years before I acknowledged the truth. Handing off a perfect project is a failure if you haven’t planned for content maintenance. One of the benefits of working in an agency is that clients ask us to create “blue sky,” perfect, ideal solutions. I get to brainstorm with few or even no constraints, and create ideal solutions for the best case scenario and the worst case scenario – completely ignoring all the complexities of the real world scenario. Even with a handful of budgetary or security constraints in place, I don’t have to worry about internal politics or selling a solution; I just need to make sure our content will solve the user’s problems and accomplish the business goals. When I’m really lucky, I then get to hand off my project to an internal content or editorial team who will make it a reality. Sometimes I stay in touch with them, answering questions, leading trainings, and helping find solutions for problems as they crop up. Still, I’m typically removed from the day-to-day struggle of implementation. Recently, a client called me, concerned. He had heard from a department in the organization, and found that they absolutely needed to include some links on a page that we had recommended remain link-free. He was very worked up, citing the best practices we had provided, concerned that he was ruining the entire experience. “We can’t follow the strategy,” he said apologetically. It suddenly dawned on me that my creation of the ideal was unfair to my clients. It is never my intention to make a client feel incompetent, or as though they’re failing the experience by compromising with other internal team members. In fact, even with this one page serving as an exception, I knew the new site was by and large following the best practices we had recommended, and I still feel confident that analytics and testing will continue to show significant improvement over the old experience. Happily, when I expressed this to the client, he relaxed. But I felt terrible. How did I end up in a place where I’m making my clients feel that they’re failing their users – or worse, feel that they’re failing me? They shouldn’t need to worry about me! The reason we create the ideal is to provide inspiration. The perfect solution, following all the amazing best practices and solving for every possible user is a concept – an example. It’s not real. What we need to balance during implementation, is the inspiration of the ideal with the reality of constraints and compromise. We want our clients to adapt our ideal to something they can maintain over time. Unfortunately, my AHA moment hasn’t made it any less frustrating to hear people say “but we can’t do this because of X new constraint.” But it’s a reminder to take a deep breathe and remember that implementation is a process. Managing a website is a full time job, and every implementation needs a content strategist who can evolve the ideal into a series of strategic elements that can be maintained in the real world. Let’s raise a glass to the in-house content strategists, the ones who don’t let themselves get beaten down by the constant repetition of “we can’t do this.” Let’s work together – in-house and agency – to inspire and create, compromise and maintain. Let’s find that balance. 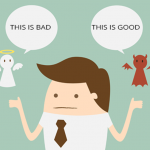 UX Ethics: Providing Benefits or Pushing a Product? Should We Create Video Content? I could not find a way to subscribe to be emailed when new posts are live. Am I missing that somewhere? Excellent work here and very inspiring, thank you! You can add the feed at marli.us/news/feed to your feedburner. Hope that helps!